Vernon and I have prayed intensely about adopting again. We believe that God has spoken to our hearts and is leading us to definitely adopt a teenage girl from the same orphanage in Ukraine that we adopted our son Joshua from. We are still praying for confirmation of whether God is calling us for a second child. Please be in prayer with us as we seek God for confirmation. Vernon and I have been married 22 years. 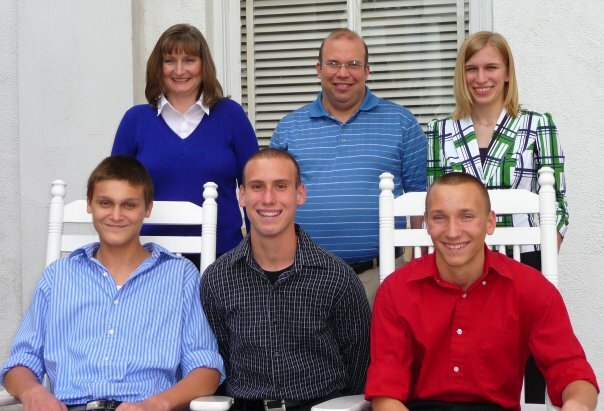 Our daughter Alex is 21, our son Anthony is 19, our son Mark is 17, and our son Josh is 16. We are beginning the process of adopting again. Many of our friends have stated that they are curious about the adoption process and would love to follow all of what is going on as we walk through another journey of adoption. That is why we are setting up this blog. I hope you will enjoy this journey with us. As for where we are in the process, we are just beginning. So far we have submitted an application for a home study update. We have a meeting with the social worker this week to actually start the home study. Chocolates have been purchased from World’s Finest Chocolates to sell. Friends have offered to collect silver and gold from our friends to melt down and make new jewelry, giving us the market price for the silver and gold. We are planning a spaghetti lunch for October 23rd, so those of you who are local and would be interested in joining us for lunch keep that afternoon open. I will let you know when we have a price set and tickets for sale. Also, if anybody has great ideas for fundraisers please let us know. We are expecting adoption expenses to range from $25,000 to $30,000 for two children. This includes home study fees, immigration application fees, airline tickets, living expenses in Ukraine for at least 6 weeks, translation fees, and many other expenses that may arise. When we adopted our son Joshua in 2009 a lot of people asked lots of questions. I will start answering some of those questions as I begin filling in my blog as we travel the path that God has laid before us. If you have any questions you would like to have answered please let me know. I will answer everybody’s questions as honestly as I can. Thank you for checking in with us.